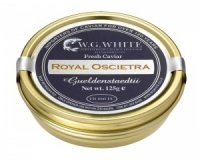 Royal Oscietra Caviar is considered to be one of the most refined and popular caviars for taste. 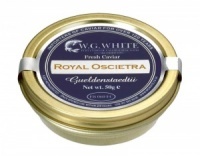 Characterised by a firm golden to dark brown egg it has a mellow nutty flavour and egg size of between 2.6 - 2.9mm. 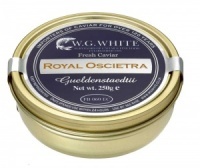 Originating only from fully mature 11 - 12 year old gueldenstaedtii, this caviar is only surpassed by Beluga in its quality.